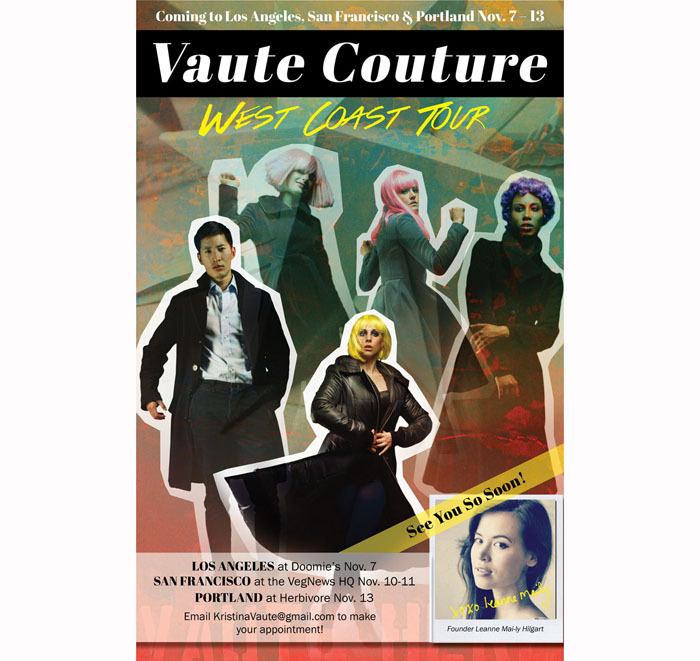 If you are a fan of vegan fashion I'm sure you have heard of Vaute Couture, the super inspiring, beautifully designed, cruelty-free, 100% vegan fashion line created by the talented, effervescent, lovely designer Leanne Mai-ly Hilgart. You can read more about Leanne in my Veggie Girl Power interview from last fall. GIVEAWAY. One WINGS coat is up for grabs guys! This is a quickie - giveaway entry period closes 11/9/12. 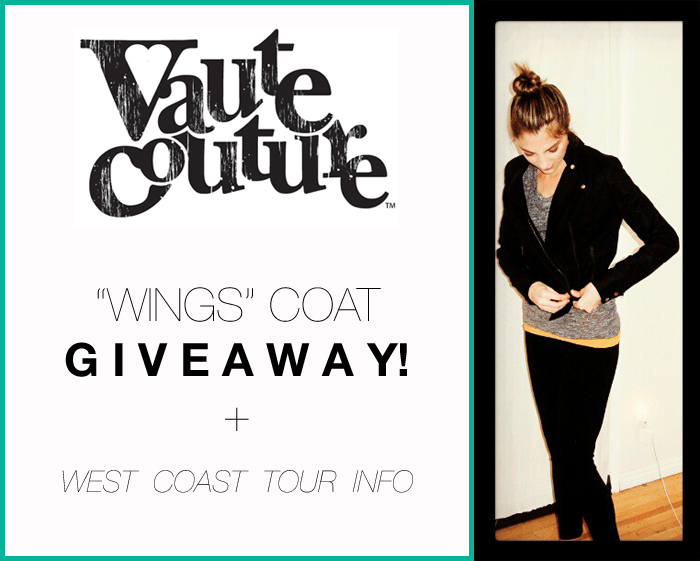 Tour dates/details and this amazing Vaute Couture WINGS Coat Giveaway ahead.. Coat Giveaway! 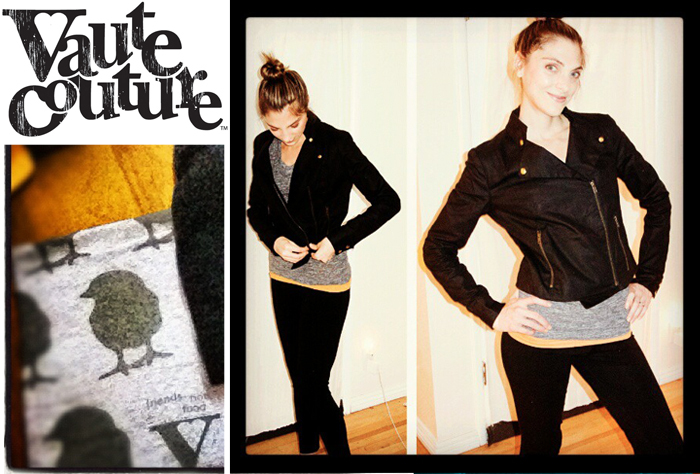 One person will win a Vaute Couture WINGS coat (retail value: $398!) - enter below..
VEGAN COATS. Leanne's coats are simply stunning. I am the very proud owner of two of them. 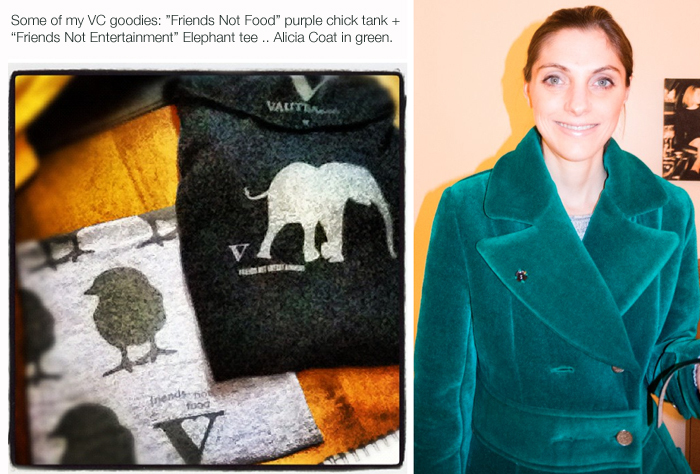 I won my very first VC coat (Alicia in emerald green velvet) in a silent auction at a Humane Society event last winter. And I was so IN LOVE with that coat that I knew I needed to save up and plan on buying another one in the future. When I read about Leanne's new WINGS design in black waxed canvas, I knew I had to have it. It is kind of like a leather coat .. without the leather! I pre-ordered my WINGS coat at a discount price because I know Leanne's designs always SELL OUT. It came in the mail and I SWOONED. I LOVE my WINGS coat. It has cozy soft lining and a heavy "waxed canvas" outer material that really does fit the body like leather would. The cute cropped style is perfect to wear with leggings, jeans or even a cute dress. Warm, yet still light and easy to wear. LOVE! photo from Leanne (WINGS in dove v-wool - LOVE so soft)..
Me showing off my "COAT-TI-TUDE" (and being a dork)..
And Leanne was generous enough to offer Healthy. Happy. Life. readers a chance to win one WINGS coat. So enter the giveaway (PunchTab form above) for a chance to win. NOTE: since the Vaute Couture designs do sell out quickly, I am doing this giveaway as a QUICKIE. It ends in ONE WEEK!! This way the winner will have a better chance of getting their prize in their size - still in stock! Note, only in-stock sizes/styles can be obtained for the prize. So if you win and the sizes available do not fit you, you can either forfeit the prize or select a size that you will be able to give as a gift.. but hopefully the winner will be able to win their size/design choice. Like I said guys, these coats SELL OUT! Open to USA addresses only. GIVEAWAY HAS ENDED - CONGRATS TO JESSICA FROM FLORIDA! You can also attend a west coast Pop-Up Shop event OR buy online ASAP if you don't want to miss your chance to grab a fall 2012 design. More of my Vaute gear..